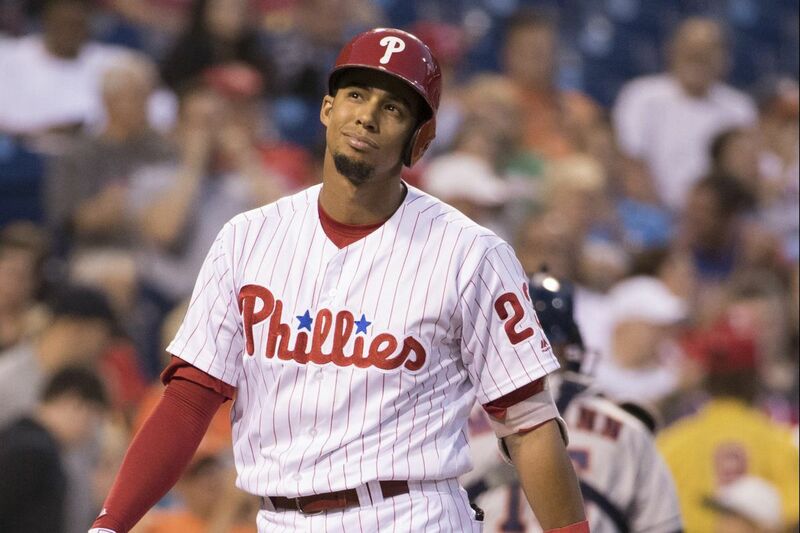 Phillies outfielder Aaron Altherr is on the DL with a nagging hamstring injury. DENVER — Aaron Altherr gingerly walked through the Phillies clubhouse late Friday night with a full plate of food. He had just received news that he would return to the disabled list with the same hamstring injury he suffered last month. He faced what could be a longer absence this time. "He was on it before and it's still nagging," Phillies manager Pete Mackanin said, "so it's hard to tell." It is a frustrating moment for Altherr, a player who has raised his stock more than anyone else on the current Phillies roster. The Phillies can now envision a scenario in which Altherr is a piece for the future. They entered the season with him as their fourth outfielder. The injuries have not dissuaded Mackanin from his high assessment of Altherr's play. "He's playing more than he probably expected to play this year," Mackanin said. "I don't know if that has an effect on his hamstrings or not. But it's something to think about. As far as his performance on the field is concerned, it's nothing but positive feedback. He's done very well to where he might be an everyday outfielder for us. "But that's part of being a first-division, winning player. Availability. Being able to stay on the field for 150 games." The Phillies recalled outfielder Cameron Perkins from triple-A Lehigh Valley to fill Altherr's roster spot. Daniel Nava started in right field Saturday. Hyun Soo Kim will start in left field Sunday, with Nick Williams likely in right. Perkins could see some at-bats, too. "I don't know," Mackanin said. "I'm just going to wing it." Altherr said the soreness in his right hamstring is "pretty similar" to what he felt July 14 in Milwaukee. He tweaked it Friday night on a stolen-base attempt. The 26-year-old outfielder has an .894 OPS. The last Phillies outfielder with an OPS that high in enough at-bats to qualify for the batting title was Jayson Werth in 2010. But Altherr, by the end of the season, may not reach the minimum number of at-bats because of his missed time. The Phillies have not yet announced a starter for Tuesday's game in Atlanta, but they will add one not currently on the roster to replace Jake Thompson, who was optioned to triple-A Lehigh Valley last week. Zach Eflin could be the choice. It would be his day to pitch; he allowed five runs in six innings Thursday for Lehigh Valley. Eflin, who made eight starts for the Phillies earlier this season, has a 4.57 ERA in 43 1/3 innings for the IronPigs. He missed some time with right elbow soreness. The Phillies have the option of skipping that turn in the rotation because they are off Monday, but it does not appear they will go that route. Sixto Sanchez allowed five runs on 10 hits — nine of which were singles — in six innings in his debut Saturday at high-A Clearwater. Sanchez, 19, was promoted this week and is the youngest pitcher in the Florida State League. He threw a career-high 84 pitches and did not walk a batter. … With Sanchez added to the Clearwater rotation, 22-year-old righthander Franklyn Kilome was promoted to double-A Reading. Kilome, who must be added this winter to the 40-man roster, had a 2.59 ERA in 19 starts with Clearwater. … Aaron Nola and Jeff Hoffman will oppose each other in the series finale Sunday. Nola was the seventh-overall pick in the 2014 draft and Hoffman went ninth. Hoffman allowed one run in seven innings against the Phillies earlier this season.